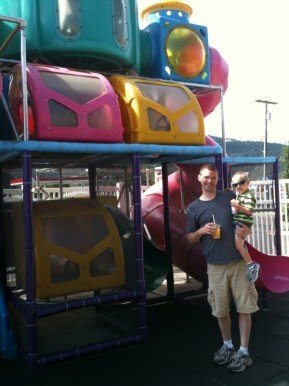 On our way back from visiting Portland we stopped at the Sutherlin, OR McDonald’s for a potty break. Tyler and I conquered every playground on our way back. You haven’t lived (or broken the playground rules) until you’re 6′ 2″ and crawl through the playplace. By the way, I would recommend more parents crawl through them because they are absolutely disgusting but it didn’t slow us down too much. After I went down the slide after Tyler I proclaimed “my life is now complete”. I don’t remember stuff like this when I was his age. Come to think of it, I don’t remember much about being three. Bring on the motorized toddler monster truck!